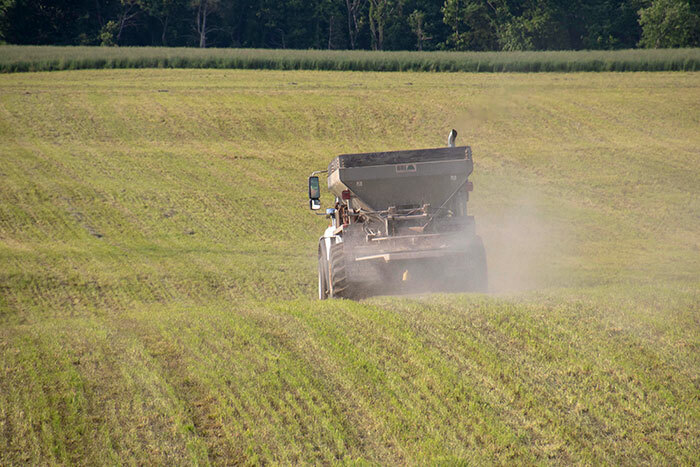 Fertilizer is and has always been a significant production expense whether you are growing corn, alfalfa, or pasture forage. Like humans, plants need nutrients for maintenance and growth, and there’s really no shortcut around this fact. George Silva, an extension agriculture educator with Michigan State University, tracks fertilizer prices each year based on information provided in the Illinois Production Cost Report, a biweekly release from USDA. The report summarizes retail cash prices for bulk fertilizer at various Illinois distributors. Though fertilizer prices remained relatively flat through much of 2018, they began to rise during the fall and early winter (Figure 1). The obvious exception to this trend was urea, which peaked around the beginning of November at over $400 per ton and fell to just under that level by the end of December (Table 1). 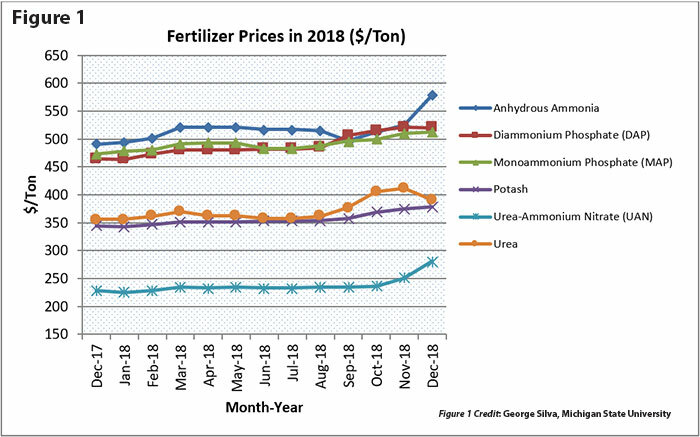 Year-over-year price changes have anhydrous ammonia (82-0-0) up 18 percent per ton, urea (44/46-0-0) up 10 percent, and urea-ammonium nitrate (UAN, 28/32-0-0) up 23 percent. Though anhydrous ammonia has always been an economical form of nitrogen (currently about 35 cents per unit of nitrogen), its use has become more limited by retail availability in some areas. At $392 per ton, urea currently checks in with a per unit nitrogen price of 43 cents. 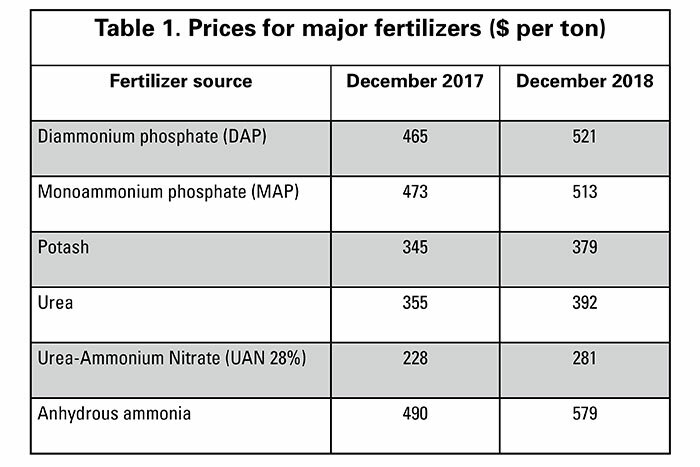 Of the three major nitrogen fertilizers, UAN remains the most expensive with a unit of nitrogen currently priced at about 50 cents. The price of diammonium phosphate (DAP, 18-46-0) rose about 12 percent during 2018, and monoammonium phosphate (MAP, 11-52-0) jumped 8 percent. After accounting for nitrogen value, both fertilizers have phosphorus (as P2O5) currently priced at about 40 cents per unit. At $379 per ton, the price of potash (0-0-60/62) increased by 10 percent during the past year. At its current price level, potash (K2O) calculates to about 31 cents per unit. That value level still remains historically low. Though the fertilizer price trend line is moving up for most nutrient sources, it doesn’t seem reasonable to assume that prices will get out of hand unless there is something that pushes commodity prices upward and corn acres dramatically rise. At least for the moment, energy prices are at low levels and this, too, has a significant impact on fertilizer production and supply. If the checkbook allows, one fertilizer cost-saving measure is to prepay at least a portion of your 2019 commercial fertilizer needs. Generally, when demand goes up, as it does in the spring, prices follow that same path. Though the need for nutrients by plants can’t be changed, the source of those nutrients can be. By now, most savvy livestock producers have put an emphasis on getting the most out of their livestock manure as a plant nutrient source. This is true of both conventional and grazing dairy or beef operations. Applying manure, either by spreader or animal, in the right place, at the right time, and in the right amount goes a long way to reducing the commercial fertilizer bill. 1. A corn crop that follows a good alfalfa stand generally needs no additional nitrogen fertilizer applied. 2. A pasture that consists of at least 40 percent legumes (usually clover) needs little to no additional nitrogen fertilizer. Making nutrient contributions to the soil to replace those that are lost has always been a balancing act between applying too much or too little. Let the soil test be your guide for phosphorus and potassium needs (or lack thereof), and don’t underestimate the importance of nitrogen for the growth of any grass crop. Yes, sometimes commercial fertilizers are the smart economic play. Many people talk about healthy soils these days, but it’s impossible to have a healthy soil that isn’t also a fertile one.